Having a manual garage door is not usually enough today. It's understandable that most people want to avoid having to lift a large, heavy door manually each time they leave or return home in their car. This is where the benefit of openers comes in - if you're looking at replacing your current system, it will help to know which types of system are commonly available. The right choice for you will be the one that fits the needs of your household. There are three main types of drive. Each has its own advantage and specific use. Some homeowners prefer quiet door openers especially if their garage is adjacent to their bedroom. On the other hand, others like to be alerted by the noise of an opening garage door for security purposes. For this reason, it's important to purchase the right drive for you according to your preference. The chain drive door opener is the oldest of the types available. It is popular due to its value and low cost. However, a loud ring is produced by the chains as it rolls and pulls up the door, making it a noisy type of door opener. 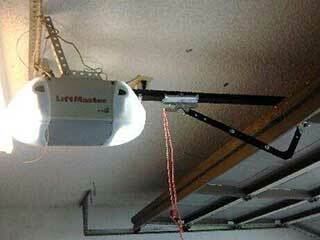 The screw drive door opener is a neutral type of garage door opener - it strikes a balance between cost and noisiness. It is usually a bit more expensive than a chain drive but cheaper than a belt type. It also comes with few moving parts, enabling it to glide more smoothly than the chain drive. This drive also has a very minimal maintenance requirement which makes it even more convenient. If looking for the quietest possible option, a belt drive door opener is always the best choice, but you may need to pay for this. This type of drive is very similar to chain drives except in that they utilize rubber belts in the rolling and pulling up of the door. Of course, there are other options to consider when looking for a new opener - for example, you'll need to check your new unit comes with the horsepower needed for the weight of your door. You may also wish to factor in any additional security requirements for your property. To discuss these things in more detail, just get in touch with our professionals at Garage Door Repair East Northport.